It takes about 36 hours of straight driving to travel from north to south along the byway. Most people take four to 10 days to make the journey. The Great River Road is a well-marked series of different roads and highways that roughly follow the winding course of the Mississippi River. All along the Great River Road, travelers will find white signs displaying the green pilot’s wheel logo. The familiar pilot’s wheel symbol denotes which roads are part of the designated route. The route has been selected for its natural, cultural, historical, recreational and scenic properties. 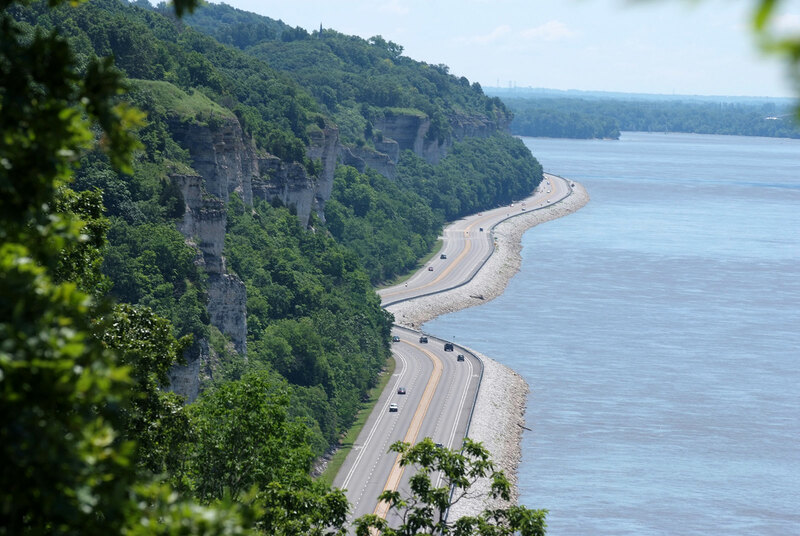 The Great River Road is designated as a National Scenic Byway. This federal designation recognizes the Great River Road’s outstanding assets in the areas of culture, history, nature, recreation and scenic beauty. All along the Great River Road National Scenic Byway, you’ll find tourism amenities as well as Interpretive Centers that help travelers experience the many facets of the Mississippi River Region. All along the Great River Road, visitors will find interesting things to see and do, including a number of river-related attractions and designated interpretive centers. The communities you’ll encounter along the way – from tiny riverside villages to vibrant metropolises – are where you’ll experience the living history of the region through music, culture and local cuisine. See traveler recommendations on what flavors to sample up and down the Great River Road. Travelers can spend a day exploring a short portion of the byway, or a week traveling through several states – or many weeks traveling the entire length of the river. It would take a lifetime to truly experience all that the Great River Road has to offer. Start your Great River Road journey today. Find current road conditions along the Great River Road.